Time Limit: Part 1 (Questions) is Un-timed. Part 2 (Speech) is 15 minutes total. See below for details. The Principles of Public Speaking DSST covers what a student would learn during a single semester of a college Speech or Communication class. Specific topics covered include Creating and Structuring Introductions, Articulation, Listening Techniques, and Critiquing and evaluating the effectiveness in public speaking. 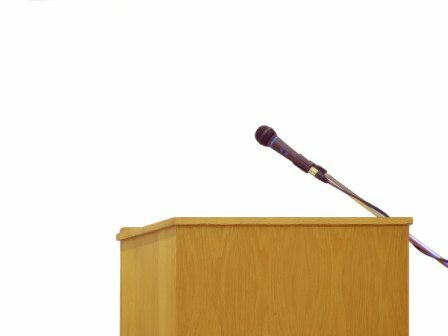 The Principles of Public Speaking DSST is probably one of the most confusing exams that Prometric offers. Though they do a great job of explaining what it consists of on the Fact Sheet; most people still get caught by surprise on the actual exam. The reason? Lack of preparing for that second portion - The dreaded speech. Though the first portion (the Questions) aren't timed, the second portion (The Speech) is, and it's the part that most people run into problems. Here's the breakdown of how the speech portion works. When you're finished with the question portion, the proctor will give you a specific topic (more on that later), and your intended audience. At this point, you get 10 minutes to write a 3-5 minute speech. If your speech comes in below 3 minutes, or above five minutes, you automatically fail the exam. Sounds pretty harsh at first, but it's actually pretty kind. They give you a whole minute and a half of wiggle room. The speech itself is graded on a pass/fail basis. So as long as you make the argument convincing and keep within the time limits, you should be okay. We're going to cover the whole speech section a bit later on, but for now let's look at the Question portion of the exam. Make sure you check out the Official DSST Fact Sheet for this exam. No, seriously.. read the sheet. This is an exam that the Fact Sheet will help you out. We're going to do this study guide a little differently. Since the Principles of Public Speaking DSST is divided into two separate portions, we're going to do the same with the study guide. First we'll cover the Question portion, as well as the resources that apply to those. Afterwards, we'll look at the Speech portion and go over some suggestions. Pearson Public Speaking Study Site - This is an interesting site that I came across while hunting for online resources. It seems to be a conglomeration of multiple textbooks divided by public speaking topics. If you go to each topic, there are a set of great Multiple Choice and True/False questions. They even have flashcards which are really, really nice to teach terminology. Highly recommended! Sparknotes on Public Speaking - My love affair with Sparknotes continues. This should take no longer than 10 minutes to read completely, and has a TON of great information that you'll undoubtedly see again on the actual exam. Just keep hitting "Next" and pay attention to the terminology as you come across it. The Art of Public Speaking (Companion Site) - You'll see this title mentioned quite often in the forum links below. It seems the home page for this book has been moved, but here's the updated link to the first chapter. Feedback is that if you go through all the chapters and take the quizzes (click the "Study Questions" link on the left), you'll see everything you need for the Question Portion of the Principles of Public Speaking DSST. The Essential Elements of Public Speaking (Companion Website) - Another recommended textbook by the DSST Fact Sheet. You can take chapter quizzes by clicking on the "Multiple Choice" links after expanding a chapter..
Principles of Public Speaking Free Forum Links - From our own Feedback area. Find some other forum posts that we don't have? Let us know via the "Contact Us" form or post them yourself in the User Submission Area. This is the section that most people need help with. I've given it it's own page to keep this study guide from becoming too long. This speech study guide started out small, but quickly grew a life of its own. You can find that page here - How to Write a Speech for the Public Speaking DSST. The Art of Public Speaking, 9th Edition - This is the textbook that everyone seems to be talking about for this exam. You can pick up a cheap used copy for less than $10 at the time of this writing. I'd recommend a college bookstore or library first though. Speech and Communication textbooks always seem to be in stock and you can usually get them for pennies on the dollar (or free if it's from the library). Principles of Speech Communication, Brief Edition - Another DSST recommended textbook. This one is over 10 years old and you can get it for less than a dollar. Watch those shipping charges on third party sellers. InstantCert Academy Principles of Public Speaking Specific Exam Feedback - There's only two of feedback for this exam, but they are a good two pages. I wouldn't subscribe just to get access to this feedback, but if you're already a subscriber than by all means check it out. Check out the forum links in the free resources area for some other great feedback on this exam. This study guide turned out to be a serious undertaking. Once you've covered the Question portion of this exam, I'd also look at the How to Write a Speech for the Public Speaking DSST page. We also have a small page full of example topics (not the real ones, but similar) so you can practice.